In 1962, Rachel Carson stunned the world with the publication of Silent Spring, exposing the lethal character of the pesticide DDT. Her work launched a global campaign against synthetic chemical toxins and veritably created a world environmental movement. But unbeknownst to Carson, an even more insidious chemical cousin to DDT had been silently poisoning the biosphere. Polychlorinated biphenyls (PCBs) were first manufactured in 1920. Seen as a “magic fluid,” they were a cheap and stable heat-transfer material used as a critical coolant in big power grids. The chemical industry soon went on to develop hundreds of other uses for this highly toxic group of substances everything from copy paper and paint to hydraulic fluids. Despite being outlawed in the U.S. since 1976, PCBs are currently found in the remotest corners of Earth and remain the most prevalent group of industrial chemical contaminants in much of the world. Every human being, from the womb to the grave, bears a body burden of these poisonous molecules forever locked in their blood and tissues. 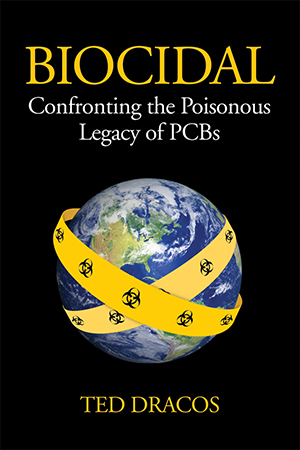 In Biocidal, investigative journalist Ted Dracos tells the full story of PCBs for the first time, starting with the chilling chronicle of how the chemical industry manipulated regulatory agencies and scientific findings for decades to continue to reap huge profits, despite their knowledge of the threats posed by their “magic fluid.” Dracos draws on extensive research to document the connection between PCBs and catastrophic human illness, presenting the latest science as studies draw ever more disturbing links between PCBs and continued health impacts ranging from cancer and autism to immunosuppression and reproductive abnormalities. Biocidal also explores the science behind the threat PCBs pose to Earth’s biodiversity: today, killer whales in the Puget Sound are dying, the eggs of Ontario Lake trout are doomed before they can hatch, 99 percent of the freshwater eels of Europe have disappeared, and frogs around the world are going extinct. While these disasters have many possible causes, evidence pointing to PCBs keeps accumulating, much like the toxins in these animals’ systems. Nonetheless, Dracos leaves readers with a profound message of hope: the damage is not irreversible. In fact, cleanup efforts that involve the removal of the source of PCBs can really work, and quickly. Offering a simple blueprint for steps that can be taken to reduce the impacts of all industrial chemicals, Biocidal ultimately points the way toward a detoxified world. PCBs have been found everywhere on the planet, in the deepest ocean trenches and the highest mountain ranges. So efficient are PCBs at migrating from the environment to the cells of living creatures that there is probably not a human being alive who doesn’t have PCBs locked somewhere in his or her tissues. We have all been chemically tattooed. We are all participants in the largest involuntary lab test in human history. Consequently, every person reading these words is directly or indirectly part of a heated scientific controversy: are PCBs contributing to the epidemic of breast cancer in the United States and Europe? In fact, the question had been answered ten years earlier. Perhaps the foremost PCB researcher in the world declared that PCBs were not harming women. He said essentially that PCBs were safe, but their reputation had suffered from an unfortunately sensationalistic media. The announcement of the safety of PCBs came from a scientist at Texas A&M, implausibly named Stephen H. Safe. Dr. Safe was (and arguably still is) the world’s preeminent expert on the subject of the toxicity of PCBs. For thirty years, he had investigated their chemistry as thoroughly as anyone on the planet and his work was cited thousands of times, more than any other scientist, living or dead. If anybody could pronounce PCBs safe to human health, it was Dr. Stephen H. Safe. In his exoneration of PCBs, Dr. Safe pointed to the largest-scale research project of its time. The results, published by the ultra-prestigious New England Journal of Medicine in the fall of 1997, had failed to find any connection between PCBs and breast cancer in hundreds of women who were chosen as test subjects. In fact, according to some interpretations, the research indicated that women with higher body burdens of PCBs actually had lower rates of breast cancer. Dr. Safe was given a full editorial page by the New England Journal of Medicine to expand on his views of the unnecessary fears regarding PCBs specifically, as well as other trace industrial chemicals that are found in everyone. Coining a new term, Safe called the public reaction to scientific and media reports about PCBs “chemophobia,” a sort of modern-day hysteria that mostly affected women--or such was his implication. Dr. Safe was quoted as telling the Times reporter that it was time to stop trying to make a connection between breast cancer and synthetic organochlorines like PCBs. “For advocates [of the idea] it’s never ending. But for other people, there may be times when we want to spend our money on other things,” said Safe. He opined that the public just had to move on. But it wasn’t time to move on. Dr. Safe would be shown to be wrong--perhaps dead wrong--both in his quasi-political pronouncements and his scientific analysis of the safety of PCBs. His controversial scientific judgments would encompass the most profound health concerns of more than twenty-three million females in the United States and hundreds of millions of women worldwide, making a tragically fascinating and ultimately disheartening tale about the realities of gender politics and the influence of money on science. In contrast to the link between PCBs and testicular cancer, there is no smoking-gun relationship between the PCBs and breast cancer. However--since the turn of the millennium--a persuasive new body of evidence has been compiled, mostly by female scientists, that argues that PCBs present a quite serious breast cancer risk to women in America and worldwide. The study that Dr. Safe used to absolve PCBs of causing breast cancer was done by lead researcher Dr. David J. Hunter, of the Harvard School of Public Health. Dr. Hunter, an Australian, was the Vincent L. Gregory Professor in Cancer Prevention, an endowed chair that gave him a prestigious academic platform he could use to advance his views on the causes of breast cancer. Dr. Hunter’s study was published in the fall of 1997 in the New England Journal of Medicine, along with the “chemophobia” editorial by Dr. Safe, which declared that PCBs were irrelevant to the breast cancer epidemic. Hunter’s study of PCBs and DDT was comprehensive--at least as far as numbers were concerned. Using data from the famous Nurses’ Health Study, which had stored thirty-two thousand blood samples from nurses across the country, Dr. Hunter and his colleagues chose 240 women who had developed breast cancer and then found a matching number of nurses who had not. After analyzing the research, the Hunter team found that there was no relationship between breast cancer and the amount of PCBs in the blood of the nurses. The levels of PCBs in both groups were essentially the same. It all seemed so clear-cut. Another chemophobic myth had been debunked. Or had it? As lead researcher, Dr. Hunter--with Dr. Safe’s editorial endorsement--had apparently based his breast cancer study on the premise that all women are genetically identical when it comes to how their bodies deal with industrial chemicals like PCBs. There were, of course, obvious benefits to the simplicity of Dr. Hunter’s thinking. It certainly made for an easy study. If all women were basically the same genetically for the purposes of the research, then all you had to do was locate some with breast cancer and compare their blood serum levels of industrial contaminants such as PCBs with the levels in women without breast cancer and voilvÅ! If the levels were about the same in both groups of women, PCBs couldn’t be the cause of breast cancer in women. In retrospect, lumping all women together as Dr. Hunter did, believing that they all would have the same genetic response to chemical contaminants--ignoring the possibility that racial or ethnic subgroups of women such as African Americans or Ashkenazi Jewish females, for example, might have dissimilar genetically based reactions to toxins (which they indeed do)--would seem implausible behavior for an epidemiologist with Hunter’s reputation, and implausible for Safe to accept. But they apparently did just that.